Healthy Snack Idea: It’s Peanut Butter Jelly Time!!! Everyone loves the classic - Peanut Butter and Jelly. Let’s turn it into a snack and make it healthier (but still very tasty!). And, let’s have a little FUN, gosh darnit! Like many of you, I often find myself grabbing breakfast on the run. But this can lead to trouble: high fat, high-sugar trouble; muffins, egg and cheese sandwiches, sweet sugared rolls, bagel with cream cheese trouble. Thankfully, though, my latest food find is a quick and simple snack that’s high in protein, not in fat. Its cottage cheese and cut up fruit. I like mine with strawberries and pineapples. I dip the fruit in and use it to scoop up the cottage cheese, but I know many people who just mix it right in, and that’s tasty too. Friendship Dairies makes a great tasting cottage cheese using skim milk, so it’s a non-fat product. To my surprise, it tastes just like other cottage cheese varieties made with more fat. There goes the myth that fat-free foods don’t taste good. Friendship Dairies even offers two varieties of cottage cheese mixed with fruit, one has pineapple and the other has peaches, but since I usually use the fruit for dipping, I stick with their plain cottage cheese. A serving of non-fat cottage cheese will get you 80 calories; pretty light considering that 80 calories have 15 grams of protein, almost 30% of your daily-recommended intake. Truth be told, I usually eat two servings of this at a time, which doubles your protein intake and is still less than 200 calories. Not only is protein an important component in the growth and maintenance of all your body’s cells, it also takes longer to digest than carbohydrates, which means that you feel full longer, which is a good thing to know for anyone trying to shed some pounds. According to The United States Department of Energy, protein helps support our skin, our bones, our blood vessels, tendons, and ligaments since they are made of collagen, which is a fibrous protein. Also, fat is a big thing to look out for with cheese, which is why I’m so psyched that this fat-free cheese actually tastes good! We’ve got a special treat for you today. We recently interviewed Allison J. Stowell MS, RD, CDN, who is a Registered Dietician and part of the Guiding Stars team. Guiding Stars is a new website that gives you an objective food-rating system which uses a scientific algorithm to show you which foods are most nutritious. From their About Page: "The more nutritional value a food has, the more Guiding Stars it receives. If a food doesn’t receive a star – it means it doesn’t meet our rigorous criteria." We asked Allison to tell us about Guiding Stars and to give us a few insider tips for healthy snacks for the summer and for taking on long car rides with kids. 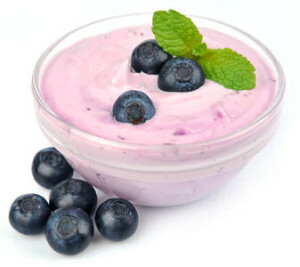 What is the Best Healthy Snack for You? When you’re looking for healthy snacks, you need to know which types are best for you. Much depends on what type of diet you’re on or what your goal is. eating plan, read through our suggestions and choose those that make sense to you. 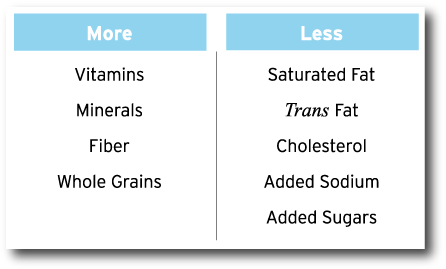 What we won’t recommend for any of these diets is unhealthy processed foods. A low carb diet is not an open invitation to consume as many high-fat foods as possible. Instead, you should choose snacks that are high in fiber and nutrients, with carbs that have a lower glycemic index, have protein and heart-healthy fats. One example of a great snack for low carb diets is celery sticks with peanut butter. Celery offers a lot of fiber; peanut butter is high in protein and has heart-healthy monounsaturated fat. Don’t use low-fat peanut butter – it’s loaded with sugar. Super high in protein and low in fat and calories, edamame makes a great snack. The big box stores now carry individual frozen servings that can be popped into the microwave to steam. Carrots and hummus make a delicious snack. Use baby carrots or carrot sticks with 1/4 cup hummus. Hummus comes in a variety of flavors such as roasted red pepper, Greek olive, basil pesto and many others. Nuts are super-healthy and ideal for a low carb diet. Any kind of nuts is okay – just keep in mind that a serving is 1/4 cup. Meat and cheese rollup – this is an on-the-go favorite. Roll up a slice of cheese or cheese stick in a slice of deli turkey or roast beef. Cottage cheese with sliced tomatoes – use low fat cottage cheese with cherry or sliced tomatoes. Find the freshest you can, locally grown if possible – the flavor difference is amazing! Low carb tortillas – if you’ve just gotta have some bread, this is a great alternative. You can use them for wraps, toast them and add butter, use one as a hot dog bun or as the basis for a personal size pizza. My experience has been that a low carb diet is the easiest to follow. There are so many foods you can eat, and you never have to go hungry…just grab a low carb snack anytime you feel the urge to eat. 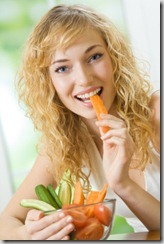 Are You Following a Paleo Diet? Eating paleo is a great way to stay healthy, especially for athletes and other active adults! Here are a few awesome snack recipes and ideas to satisfy even the worst case of the munchies. First, preheat the oven to around 300 degrees. While it’s warming, wrap small pieces of goat cheese with prosciutto and poke through with a toothpick. Place them on the skillet and put it in the oven. Keep an eye on them; it takes just a couple of minutes to slightly crisp the prosciutto and soften the goat cheese. Serve immediately with olives, fruit, and nuts. This one’s a great mid-afternoon snack for guests. First, hard boil a few eggs. Make sure you toss some salt in the water to make them easier to peel. While they’re boiling, heat up some bacon in a skillet. For best results, use thick-cut smoked bacon. When the eggs are done, cool and peel them, then cut them lengthwise. 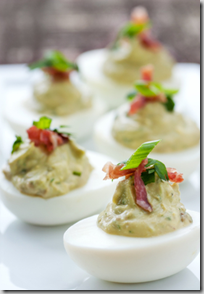 Put the yolks in a bowl, and combine with chopped up bacon bits, guacamole, and a dash of lemon juice. Mash them up, and spoon or pipe back into the egg yolks and serve immediately. This old classic is as paleo as it is delicious. It’s incredibly simple too. Hard boil a few eggs, and heat up some bacon in a skillet. Remove the bacon while it’s still chewy. Peel the eggs and wrap them in bacon; it helps to use a toothpick to hold in place while you serve them. Come on, ’fess up: How many of you can’t buy peanut butter because you know that once you open it, you won’t be able to get your finger out of the jar? I’m very guilty of the above-mentioned crime, so I was psyched to see that a new company calledJustin’s sells single-serving 100-calorie squeeze packets (.6 oz) of organic honey peanut butterand natural maple almond butter. Now I can have my much-loved healthy snack of peanut butter and pretzels or peanut butter on an apple without having to worry I’ll eat a whole jar. I suggest bringing a packet with you to school or work, along with a small bag of celery, whole-wheat rice cakes, pretzels, or apple slices, for a great mid-morning or late-afternoon snack. Usually, I prefer almond butter to PB (peanut butter), but Justin’s 100-calorie almond butter is maple-flavored, and I’ve never been a fan of maple-flavored things (though I do like maple syrup on pancakes), so I prefer the honey PB packets. Peanut butter is not quite as good for you as almond butter, because it has less monounsaturated fat (good fat) and more polyunsaturated fat (bad fat), but both nut butters are great sources of protein, Vitamin E, and niacin. Plus, they help you feel full longer and give you long-lasting energy, which is why I particularly like to eat them in the morning (on whole-grain toast) or before I run. (See this Runner’s World article for more info on why PB is a good pre- and post-workout snack.) Also, Justin’s peanuts are USDA Certified organic and tested aflatoxin free, and the butters don’t contain any added oils or refined sugars.